If you're like me, you probably watch Comedy Central's "The Daily Show." If you're like me, you probably also turn to reruns of "Scrubs" or "Seinfeld" when the newsmaker interview comes on. If that's the case, you probably missed me and Jon Stewart playing Rock 'Em Sock 'Em Robots last week. It started civilly enough, discussing my new book, "Liberal Fascism." But things got sufficiently testy that we spent nearly 20 minutes swearing and sparring, and only six minutes aired. 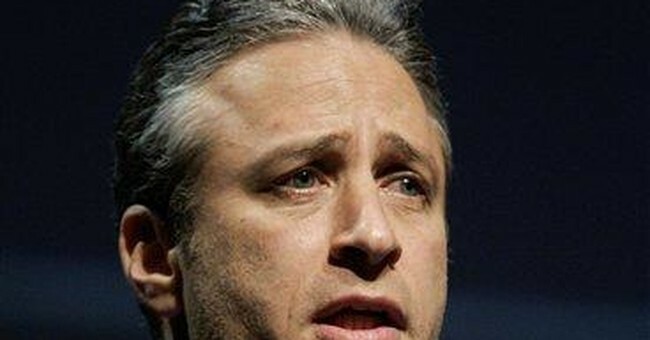 The result was "choppy as hell," Stewart conceded. Largely left on the cutting-room floor were some important points that might have made my book seem a bit more nuanced. When he railed about conservatives and gay marriage, I pointed out that in my book, I'm sympathetic to it. When he took shots at Republicans, I noted that I criticize the likes of President Bush and Pat Buchanan for being "right-wing progressives." Viewers in search of more than disjointed, stuttering cross talk would be disappointed if they caught the whole exchange - it was all like that. Stewart, try as he might, could not understand where I'm coming from. His stated problem, in a nutshell, was that he didn't like the book's title or its cover (bright red with a smiley face - oh, and the smiley face has a little Hitler mustache). Stewart's complaint, echoed all over the Web, radio and TV by other critics, is that a book can indeed be judged by the cover. And because the title and cover amount to a giant insult to liberals (only Stewart didn't use the word "insult"), it can be dismissed out of hand. I tried to explain, for those whose feelings were so hurt they didn't even crack the spine, that the title "Liberal Fascism" comes from a speech delivered by H.G. Wells, one of the most important and influential progressive and socialist intellectuals of the 20th century. He wanted to re-brand liberalism as "liberal fascism" and even "enlightened Nazism." He believed these terms best described his own political views - views that deeply informed American progressivism and New Deal liberalism. As for the smiley face, that's a reference to comedian and social commentator George Carlin, who explained on HBO's "Real Time with Bill Maher" that "when fascism comes to America, it will not be in brown and black shirts. It will not be with jackboots. It will be Nike sneakers and smiley shirts. Smiley-smiley." I'm persuaded that Carlin was right - to the extent that fascism of any kind will come to America, it will do so in the guise of something "progressive." Indeed, American progressives, particularly before Hitler arrived on the scene in the 1930s, were openly sympathetic to Italian fascism. This isn't to say they copied it (or the fascism of Soviet Russia), as many claim. But rather that the ideas that gave birth to and fueled American progressivism - philosophical pragmatism, Bismarckian "top-down socialism," Marxism, eugenics and more - share common intellectual sources and impulses with those that gave us both socialism and fascism. We've allowed the staggering moral horror of the Holocaust to color our conception of what fascism was. But Wells, the editors of the New Republic and such muckrakers as Lincoln Steffens and Ida Tarbell didn't have any idea the Holocaust would happen when they endorsed Benito Mussolini's efforts. Meanwhile, liberals routinely and cavalierly call conservatives Nazis and fascists - with the Holocaust fully in mind - without inviting an ounce of opprobrium from the same folks screeching about me. Naomi Wolf argues in "The End of America" that America today is in every important way identical to early-1930s Nazi Germany. Christopher Hedges (a former New York Times reporter and Pulitzer Prize winner) penned a book called, subtly enough, "American Fascists." Guess who he was talking about? Jesse Jackson, Paul Krugman and Bill Clinton, among other prominent liberals, have insinuated or declared that conservatives are the spiritual or intellectual heirs of Nazism. Such charges are simply false. We've come to use the word "fascist" as a substitute for "evil" or "bad." The left in particular has institutionalized argumentum ad hitlerum as a means of delegitimizing viewpoints they find objectionable. That's why Al Gore calls his online critics "digital brownshirts" and suggests anyone who ignores his warnings are akin to those who willingly ignored the Holocaust. As much as it may shock some, I'm not the first person to set the record straight. Maybe those authors didn't penetrate the public debate because they tend to write books titled "Illiberal Policymaking and Culture Formation, the Anglo-American Experience, 1912-2007." If I'd followed their example, no one would be buying my book, reading it or discussing it. And, you can be sure, I wouldn't have been invited on to "The Daily Show" to get smacked around for 20 minutes.